This crumble is either distressing because the idea of nectarines in a crumble is inherently wrong; or because it was written in a hospital waiting room. Read their rules and regulations, and learn that you’ll be seen for “ideally below ten minutes”, and in “thirty to ninety minutes of arrival”. Have a paper cup of water. It’ll be useful when you have to give a urine sample . Try to think of what you’re going to say to the clinician. Construct recipes and explanations in your head. Construct apologies for being there alongside the explanations and apologies. Try very, very hard to focus on the nectarine crumble instead of the screaming woman in the corner. Feel grateful you aren’t the screaming woman in the corner. Feel guilty for feeling grateful that you aren’t the screaming woman in the corner. Wonder how far you are from being the screaming woman in the corner. Try harder to think about nectarines. Think about nectarines. Think about nectarines. By the time you’re seen, the nectarine crumble is perfect; you have baked it through in your head a hundred times. Listen carefully to the clinician; to the doctors, the specialists. Think about nectarines. Go home, later, clutching your fistful of pills and prescriptions. Bake the crumble exactly as planned. It will be perfect; you will feel, perhaps, that it was worth it just for the crumble. It will take longer to realise that it was worth it for more than that. 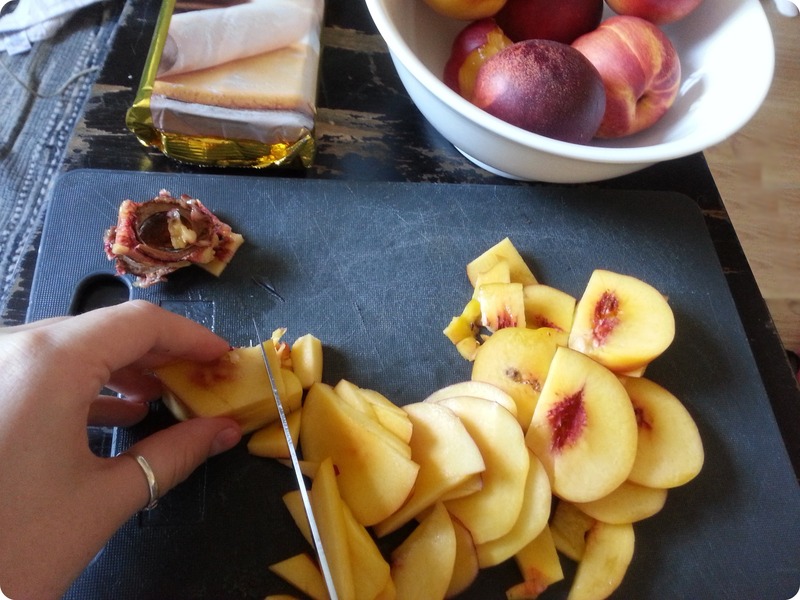 But you will realise, and every time you think about nectarines, you will feel grateful, and you will feel lucky. Suitable for lactose-intolerant people, which is a nice surprise. 30 mins prep., 30-45 mins baking. Golden marzipan, about 1/2 a block. Big bowl; baking tin; fork; sharp knife; diazepam. Slice the nectarines; rounds will look prettiest, but frankly, nectarines are a bugger to slice immaculately, and anything will do. Slice the marzipan diagonally into as thin strips as you can muster. Hold them to the light and look at the world through this goldy haze. Isn’t it beautiful? Isn’t it worth sticking around for? Realise, with a sudden sinking feeling, that you have lost the bottom of the cake tin in which you had planned to make the crumble. Have a panic attack; wonder if you ought to go back to hospital. Decide against it. Be consoled. Dig out an old baking tin from the back of the cupboard and attempt to scrub the strange caked-on burn from it; fail, but carry on regardless. You are good at this! You can do this! It doesn’t matter if it’s got some slightly old burn on the bottom! Deposit the sliced nectarines into an ordinary saucepan; add, perhaps, a splash of olive oil, just for bitterness’ sake. Don’t if you don’t want to. I quite understand it’s a little odd. Let them cook down a little bit, softening them, ripening them. Taste them. Spoon them into the baking tray. Layer the marzipan over the top in a messy half-hearted cross-hatch, like a toddler doing weaving with strips of sugar paper. Roughly crush the walnuts with a pestle and mortar. Pound them to a pleasant pebbly mulch. Ponder how much better it is, probably, taking it all out on walnuts than your own arms. Look briefly at your arms. Look back to your walnuts. Scatter about half the walnut-bits across the marzipan. Sprinkle the whiskey over that. Inhale the beautiful walnut-whiskey-almond-nectarine-ness of it all. Feel better. For the crumble topping, I’m afraid you’re going to need American cup measurements, because apparently nobody English thought it was worth working out the Tall Man has very kindly done a lot of maths for me and now we can all have delicious lactose-free crumble and not die of eating butter. Hurrah! So. 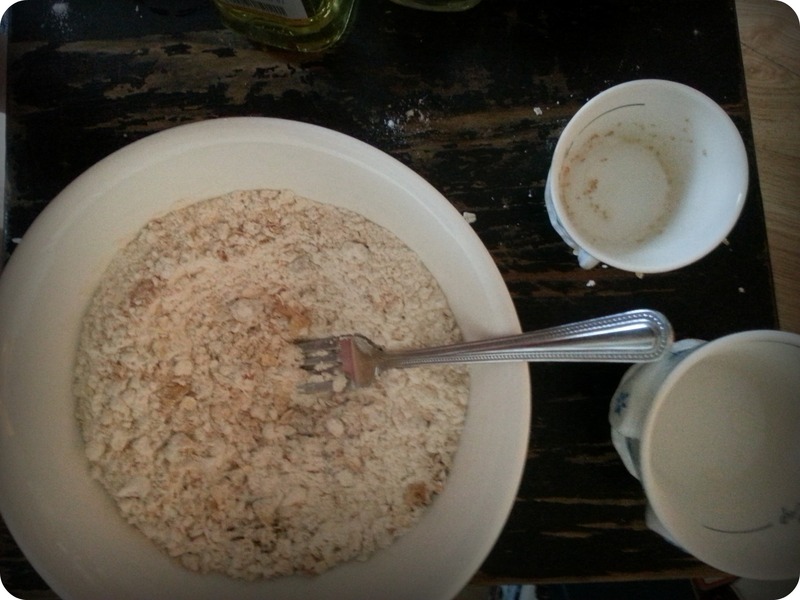 Take 180g flour, 120g brown sugar, the rest of the crushed walnuts, 90g rolled oats, 70 ml olive oil, and 30 ml groundnut oil. Put in a big bowl. Stir with a fork. This is surprisingly like real crumble, I swear. Spoon over the delicious things in the baking tray; press down with the back of the spoon; scatter a bit of brown sugar over the top, you decadent lord, you. Put the crumble in the oven. Set the chicken timer for 30 mins. Take a deep breath. There you go. You did it. You did something. Well done you. It’s going to be okay, you know that? When the chicken timer sings, take the crumble out. Use oven gloves. This is obvious, but easy to forget when you just came out of hospital. Use oven gloves. You have nice hands. Serve with cream, or ice-cream, if you aren’t lactose-intolerant-ish, and if you are, I would really love your suggestions, because goat’s yoghurt just ain’t cutting the mustard. Which is, I suppose, better than cutting myself. But it’s still not great. Unlike this crumble, which is both. These are the two things that saved my life. 1. I’d like to claim credit for being the first person to mention urine samples in a recipe for nectarine crumble.